Hair got shiner. I’m not sure this in an improvement in the short term, to be honest. But I am learning slowly how to draw hair. It will get better. I’m looking into how to handle backgrounds. They are still partially drawn lefthanded right now, but there are things I can do to make them better I think. I will look into drawing them with more computer assisted tools (pen tool, gradients, pattern overlays, etc). I think this is the approach many comics take anyway. And no, Kally, I don’t think Tyler will appreciate the difference. There is a new vote incentive! You can click to the left of this on the icon or click here. Hopefully this comes after tax season for most of you. It was based on a suggestion by a reader – ever have an incentive you’d like to see, feel free to send it along! As a reminder, there is still a bonus page promotion till the 31st; support us at any tier on Patreon and we will post an extra comic update! 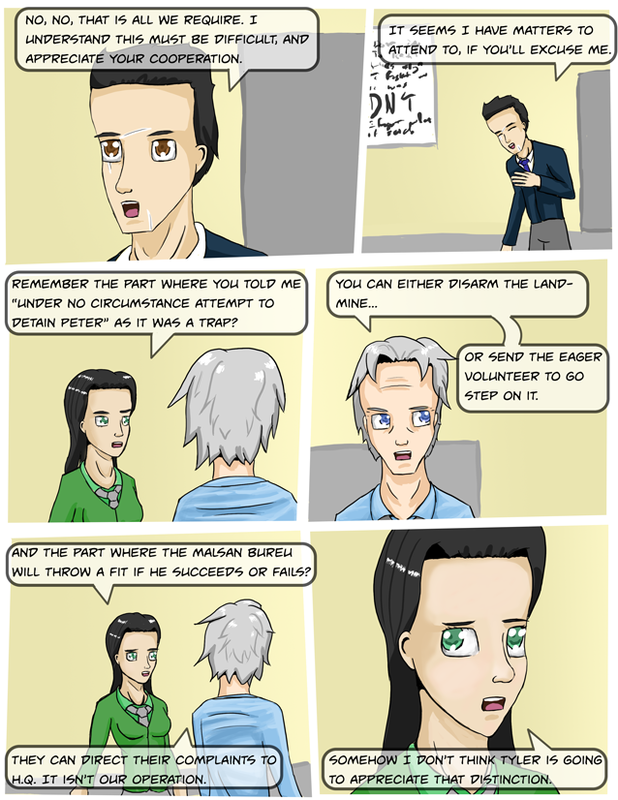 Also, Page 3 has been updated to shiny new art. For those that pay careful attention, I also am redoing the words – in some cases this is pretty minor, in some cases less minor. Nothing is actually different; most of the differences are removing awkward bits, shortening dialogs that don’t mean much, and keeping characterizations a little more consistent. When I started I’d had about as much experience writing comic dialog as drawing, which is to say none, so sometimes it needs buffering. I ran an ad with Hiveworks recently – I think they’d view it as good marketing if they saw your comment! 😀 They are pretty ubiquitous among webcomics (an impressively large part of the major ones are with them now). I’m very pleased at how good you’re getting with your left hand and only partial use of your right. I think you’re going to be pretty surprised at what you’ll be able to do when you recover full use of it again. Sure hoping it gets better. Getting close to physical therapy which means I’ll at least by able to try to move the shoulder. I’d expect there will be some evolution on hair coming – I’m slowly learning; I really want to improve the art.